•	Two-piece elbows available in either Long or Short Radius, and completely stitch-welded from end to end. 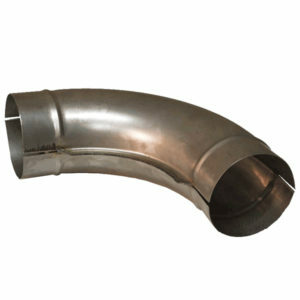 •	Exceed SMACNA’s high velocity, medium pressure requirements (-2 inch WG to +10 inch WG). •	Conform to ASTM A653/A924 standards. 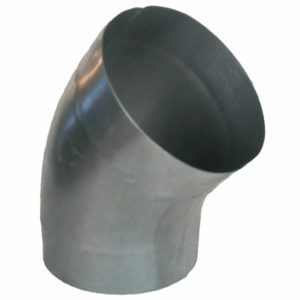 •	Stock elbows are made from G60 (or higher Zinc content) galvanized steel sheets. •	Stainless steel available upon request in select sizes. •	Two-piece elbows available only in Long Radius with a flange around the throat and heel of each half. •	Flanges make these elbows incredibly simple to assemble, even in the field, without the need for any special equipment. 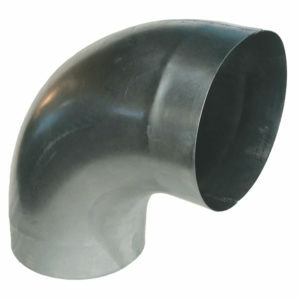 Flanges also allow these elbows to be shipped as halves, which translates to savings in shipping and warehousing costs. 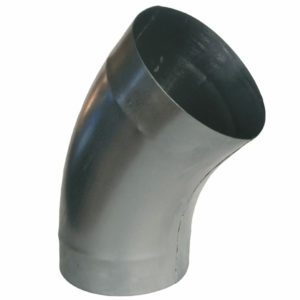 •	Stock elbows are made of 20 gauge galvanized steel or 20 gauge stainless steel. •	Galvanealed, PVC-coated, aluminum, 18 gauge galvanized, 16 gauge galvanized, 18 gauge stainless, and 16 gauge stainless steel are all available upon request.